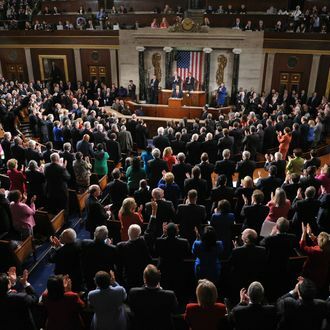 Two years ago, in the wake of the shooting of Gabby Giffords, Colorado senator Mark Udall proposed that Democrats and Republicans sit side-by-side, instead of separating themselves by party, at the upcoming State of the Union address. Senators and congressman paired up with colleagues from the across the aisle in what turned into a kind of congressional prom night. (King and Queen: John Thune and Kirsten Gillibrand. Daaaaayum.) The tradition continued in 2012, but this year, lawmakers seem to be losing interest in continuing this completely disingenuous display of bipartisanship. Bipartisan date night will still happen, to some degree — Gillibrand tweeted yesterday that she’s sitting with John McCain this year, for example — but it doesn’t appear that it’ll be as widespread this time around. Which is fine. The American people are not children, and don’t need members of Congress to pretend that they “get along just fine” for our benefit, like divorced parents at Christmas dinner.